There are two things I like about Thanksgiving. 1) The extra day off work and 2) pumpkin pie. In fact, I think I like the pie more than I like the long weekend. Make that 100 per cent yes I love pumpkin pie more than having a day off work. If I had to choose between no more weekends EVER and the extinction of pumpkin pie, I would choose no more weekends. 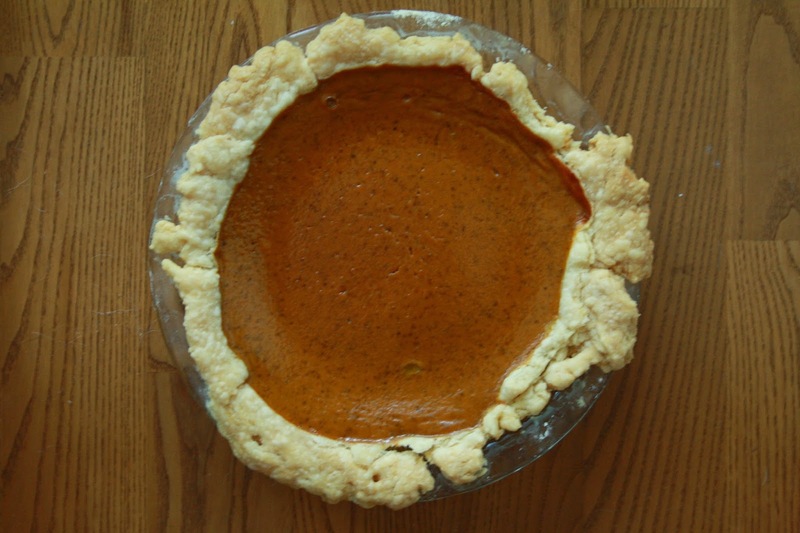 Because pumpkin pie is awesome and delicious and OMG PIE. Make sure all the ingredients are as cold as possible. Using a food processor or pastry cutter and a large bowl, combine the flour, salt, butter and shortening. Process or cut in until the mixture resembles coarse meal and begins to clump together. Sprinkle with the water, let rest for 30 seconds and then either process very briefly or cut with about 15 strokes of the pastry cutter, just until the dough begins to stick together and come away from the sides of the bowl. Turn onto a floured work surface and press together to form a disk. Wrap in plastic and chill for at least 20 minutes. Allow the dough to warm slightly at room temperature if it is too hard to roll. On a lightly floured board, roll the disk to a thickness of 1/8 inch. Cut a circle about 1 1/2 inches larger than the pie plate. Transfer the pastry to the plate by folding it in half or by rolling it onto the rolling pin. Leav an edge that's about 1/2 inch over the plate. Flute the edges. Prepare the crust. Chill for 20 minutes while preparing the filling. Preheat the oven to 350 degrees Farenheit. In a medium bowl, whisk the eggs lightly. Add the remaining pie ingredients and whisk thoroughly. Pour into the prepared crust. Bake for 55 to 65 minutes, or until the crust is golden and the filling is just set and no longer liquid in the centre. Cool thoroughly before serving. Using an electric mixer, beat all the ingredients until soft peaks form. Serve with the chilled pie. Store the pie in the fridge for up to three days.